The Football Front: The most hated man in football? 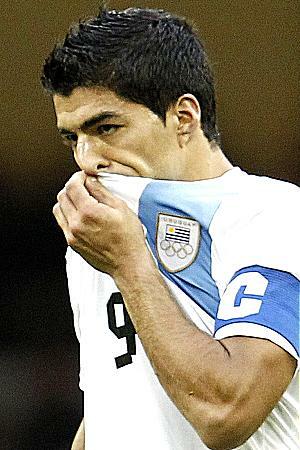 Callum Rivett reflects on Luis Suarez and whether he is the most hated man in football. It was the London 2012 Olympic football tournament, Team GB versus Uruguay. The low cross came in, and he sprang, diving for a header, but instead nearly catching the ball in his hands. The referee blew hit whistle, signalling for a free-kick against him. He got up and protested furiously, saying something (judging by his gestures) along the lines of: “It never touched my hands, honest!” The referee didn’t buy into it. A yellow card was produced from the referee’s pocket, provoking a massive round of cheers and whoops from the watching crowd. The cheering wasn’t the start of it, nor the end of it, as every time he had touched the ball he had been booed, every time he was tackled there had been cheers, and every time he dragged a shot wide there had been massive jeers. Was this the most hated man in football? This jeering and hatred had started due to an event almost ten months previous, which included the player mentioned and a rival player. A charge of racism and an eight match ban was the consequence from the FA; but the thing in tatters, never to be resurrected, was his reputation. The game was Liverpool versus Manchester United, 15th October 2011. It seemed like just a normal match - and it was - until the accusations made after the final whistle came to light. It finished 1-1, but the thing it will most be remembered for, unfortunately, is this: Luis Suarez, Liverpool striker, had been accused of making a racist remark towards Manchester United left back Patrice Evra. There was widespread outrage. Phones rang through to BBC radio football call-in show 606, many callers with the view of an enquiry into the matter, others already calling for Suarez’s head. The FA did investigate, then produced a four hundred and fifty-odd page report on the reasoning behind Suarez’s conviction, which was released to the media and public at 5pm on New Years Day. He had already been handed an eight match ban and a £40,000 fine on December 20th, and was just waiting for Liverpool to make a possible appeal. Despite the shows of support towards Suarez - including the whole squad, whilst warming up, wearing a white t-shirt with Suarez’s famous knee-slide celebration, depicted in red on the front with “Suarez 7” on the back - no appeal came. Suarez then served his ban and came back into the Liverpool squad. This was not the first, nor second, time Luis Suarez was at the centre of massive controversy. On the 20th November 2010, in an Eredivise match between Suarez’s Ajax and PSV, Suarez bit a opposition player on the neck/shoulder after appearing to disagree with a PSV players opinion when an Ajax player was sent off late in the game. He received a seven match ban. Then, on the biggest stage of all, in the World Cup he saved a goal-bound shot by Ghana forward Dominic Adiyiah in the last minute with the score at 1-1. Asamoah Gyan then missed the resulting penalty, causing Suarez to celebrate wildly on the sidelines after being sent off. Uruguay went on to win on penalties. After the penalties Suarez was paraded around on his team mates shoulders. When Liverpool played Fulham at Craven Cottage in December 2011, Suarez then put his middle finger up at the Fulham fans in response to the abuse he was getting. He received a one match ban. In February he then intentionally kicked Scott Parker in the stomach in the Spurs penalty area. No action was taken by the FA. A professional footballer like Suarez should know better: swearing at fans, racial abuse, blatant cheating, kicking opposition players. Then, when Liverpool met Man United again later in the season, he refused to shake Evra’s hand before kick-off. When the match finished (Man United won) Evra then paraded himself in front of Suarez, celebrating madly. He was quickly stopped by the referee and players from both sides, but for once Suarez ignored it and didn’t get involved. Manager Kenny Dalglish did not handle the situation well, and it probably accumulated - along with a poor season - in him losing his job. He backed Suarez to the hilt, but was proved wrong by the FA. So I want to know what you think: is Suarez the most hated man in football?